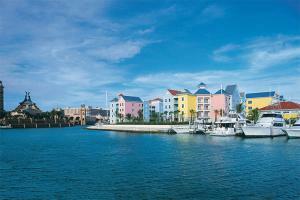 With its colorful architecture and warm hospitality, Harborside Resort at Atlantis celebrates the uniqueness and beauty of The Bahamas. The features spacious residential-style villas, offering guests kitchens or kitchenettes, creating a home away from home feeling. Nestled between Marina Village and Nassau Harbour, the resort offers guests the ideal blend of world-class fun and relaxation.